Diabetic peripheral neuropathy affects up to 50% of people with diabetes and results in significant morbidity and mortality resulting in significant healthcare costs. There is increasing evidence that small unmyelinated nerve fibres that mediate pain and thermal sensitivity (C-fibres) are involved early in the development of neuropathy in type 2 diabetes. 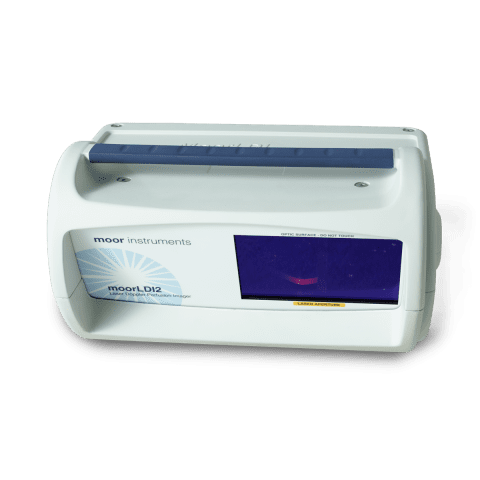 A heating test (combined with blood flow imaging) has been developed to asses increases in skin blood flow at the site of heating and also increases in blood flow in the surrounding skin due to axon reflex flare. It has been found that the flare response, in terms of flare area surrounding a heated central region, is impaired in patients with early neuropathy compared with those without neuropathy. The LDI-Flare test originally developed by Krishnan et al has been refined for speed and sensitivity by Vas et al by pre-warming patients and increasing the stimulus temperature from 44°C to 47°C. The moorLDI2-IR offers laser Doppler blood flow imaging of the feet and can be used with a clinical mobile stand (MS2-MKII). The heat challenge is provided by moorVMS-HEAT (unique embedded software is offered on request with higher heat temperatures and restricted heat duration). Littleford RC, Khan F, Belch JJ. Skin perfusion in patients with erythromelalgia. Eur J Clin Invest. 1999 ;29:588-93. Kellogg DL Jr, Hodges GJ, Orozco CR, Phillips TM, Zhao JL, Johnson JM. Cholinergic mechanisms of cutaneous active vasodilation during heat stress in cystic fibrosis. Gordois ASP, Shearer A, Oglesby A. The costs and consequences of peripheral neuropathy in the UK. The LDI flare: a novel test of C-fiber function demonstrates early neuropathy in type 2 diabetes. Malik RA, Tesfaye S, Newrick PG et al. Sural nerve pathology in diabetic patients with minimal but progressive neuropathy. Vas PR, Green AQ, Rayman G.
Small fibre dysfunction, microvascular complications and glycaemic control in type 1 diabetes: a case-control study.